I love rhubarb. The versatile red stalks with their delectable combination of sweet and tart are not only perfect in pies. They are also great in ice cream! Now, I already had a fantastic rhubarb ice cream recipe, but why settle only for one? Read on, and we will explore the rather exotic combination of rhubarb and lemongrass! Rhubarb – tart and delicious! Rhubarb, with its reddish stems and their particular mix of tart and sweet, is a perfect ingredient for a refreshing summer ice cream: Avid readers know well that no summer goes by in my household without the frequent churning of my favourite Rhubarb Yoghurt ice cream. 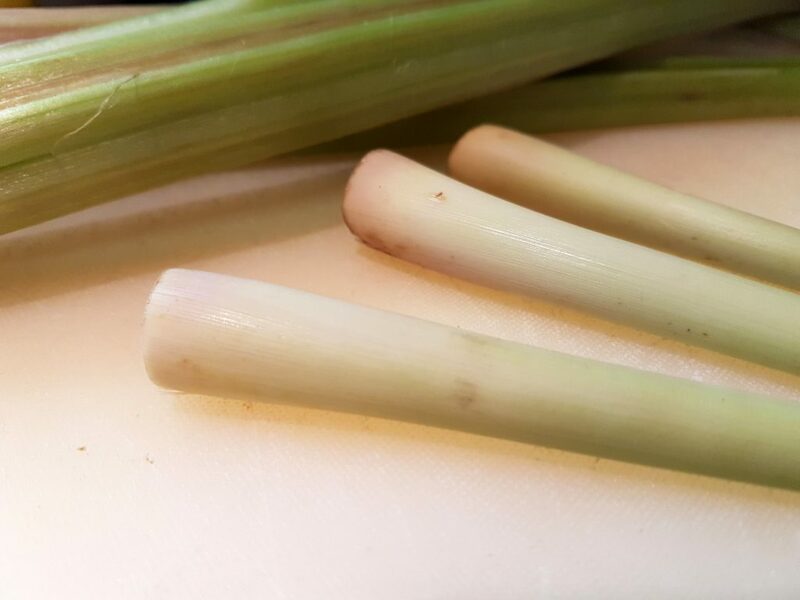 But this time, we will change the flavour palette and use delectable lemongrass for a tantalising contrast to the rhubarb’s own flavour. Lemongrass – much used in Asian cuisine, but also purported to have medicinal qualities (against stomach ache, for example). Lemongrass (also known under several other names, such as Barbed Wire Grass or Gavati Chahapati) is a culinary herb in Asian cuisine. 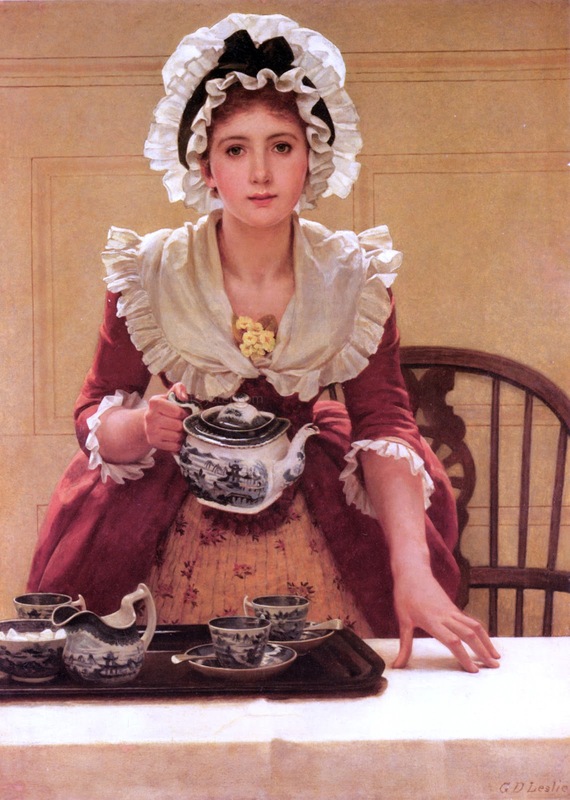 In India, it is believed to have medicinal qualities, and in some African countries, it is also used for tea. Lemongrass oil, while acting as an insect repellent, can also be used to attract honey bees! 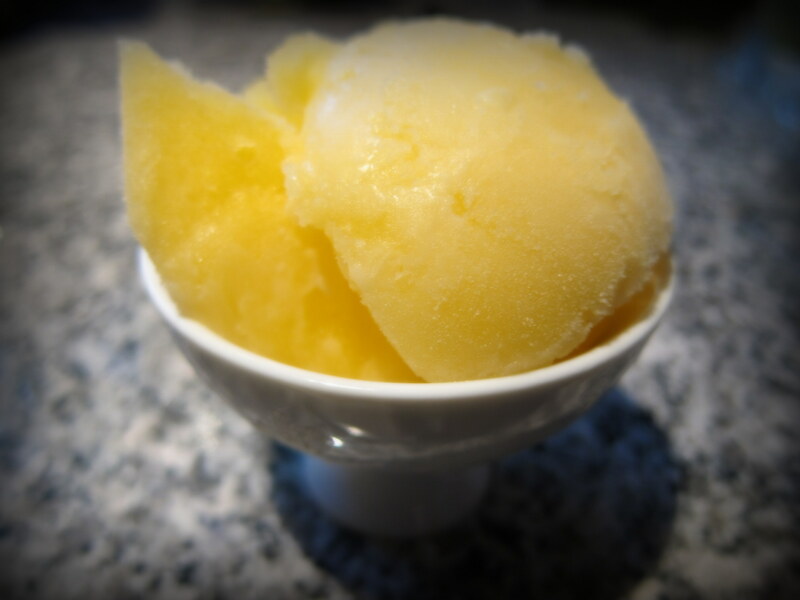 Its particular citrus flavour is quite subtle, but we will add enough lemongrass to ensure that it leaves its unmistakable flavour imprint on the ice cream! I got the inspiration for this rather exotic pairing of rhubarb and lemongrass from the impressive Stella Parks. 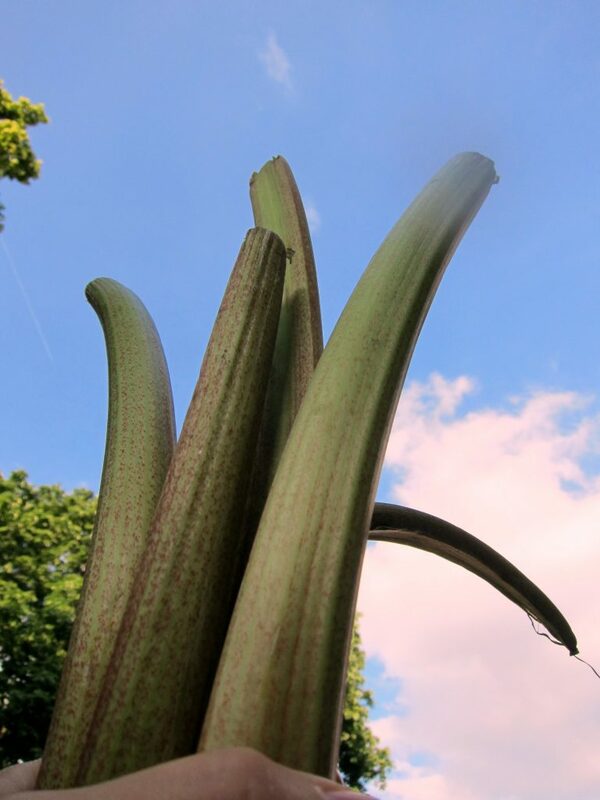 While her lemongrass poached rhubarb was devised to be enjoyed on its own, we will use the main idea as the defining part of our summer ice cream! The first quick step – take a few minutes and make rhubarb-lemongrass purée in the micro! 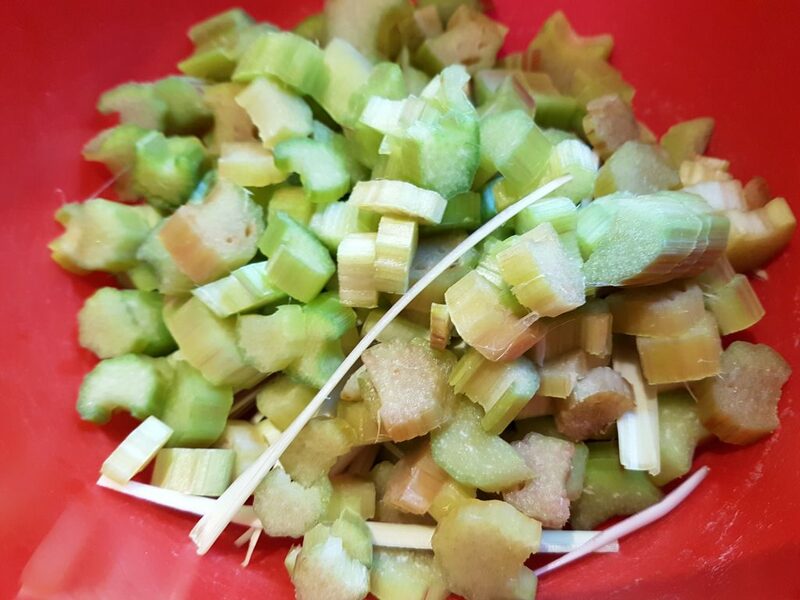 Peel the rhubarb stalks and chop them up in smaller pieces. Also peel and slice the lemongrass (stem) : the pieces of lemongrass are too sturdy to turn into purée so we will have to remove them later on. To make that removal easier while ensuring maximum flavour exposure, I recommend slicing the lemongrass in roughly twice-match stick-thick slices: that way, you will even be able to remove them by hand later 😉 . Close.up of the chopped rhubarb and the sliced lemongrass, getting ready to be puréed. Put it all in a micro-safe bowl, together with the sugar(s), the vanilla and a pinch of salt. Since the rhubarb stalks contain a surprising amount of liquid, the micro-wave oven should be able to transform the rhubarb into a purée in about 6-9 minutes (depending on the effect of your micro, obviously). Once the rhubarb stalks, the sugar(s), salt and the vanilla have turned into an aromatic purée (with sturdy sticks of lemongrass within), take out the bowl and cool down the purée (ideally, if you have time, let the purée chill a few hours in the fridge). The sturdy lemongrass will remain rather stiff, but that is no problem. Let them remain in the purée for now, delivering their flavour input to the mix: before churning the ice cream base, we will remove the lemongrass pieces. After less than ten minutes in the micro-wave oven, the rhubarb has turned into purée. 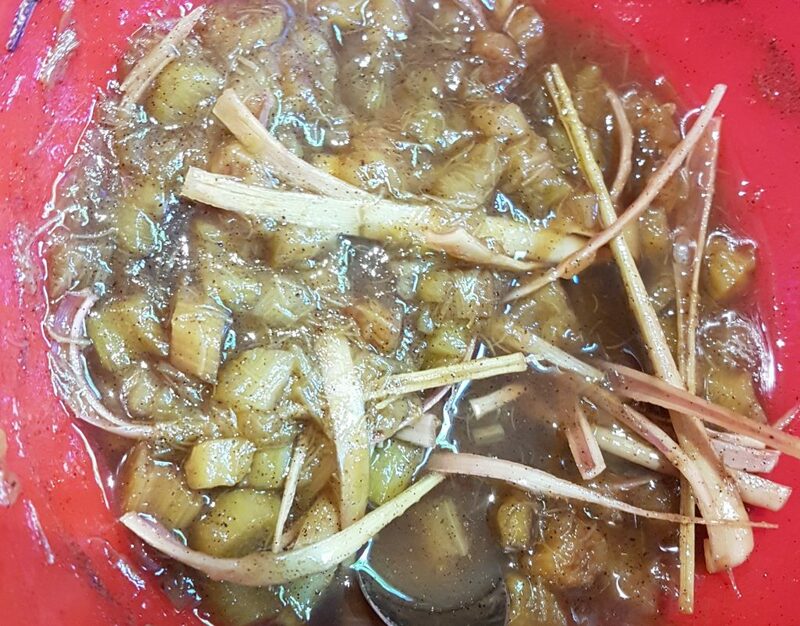 If you have no micro-wave oven – do like this: Put the chopped-up rhubarb and the sliced lemongrass, the sugar(s), salt and the vanilla in a sauce pan. Cook on the stove (while whisking every now and then) for about 8 minutes or so. Remove (by hand or sieve) the sliced lemongrass and, with the help of a hand mixer or similar, make sure that the purée really is thoroughly puréed and smooth. Then, put the sliced lemongrass back in for continued infusion during the cool down/chill down). The even easier next step: Whip the cream, remove the pieces of lemongrass, blend it all together and freeze! 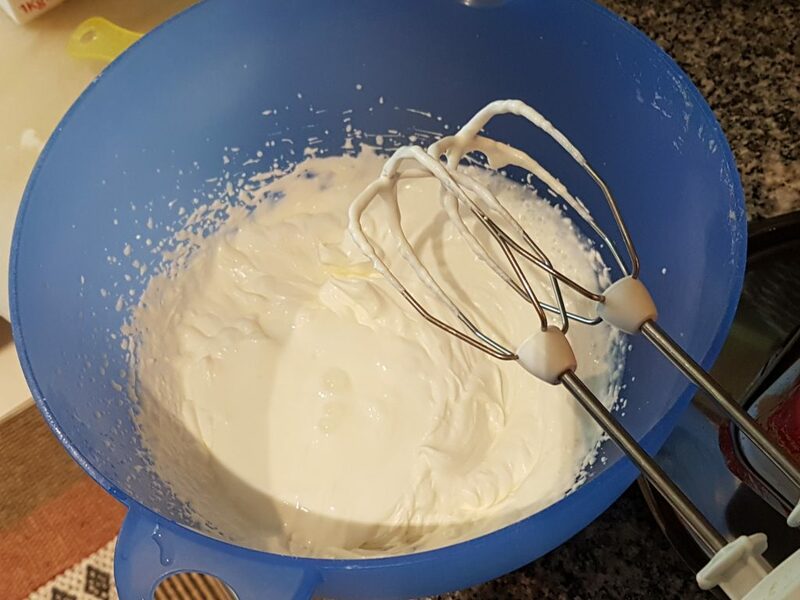 Whisk the cream to the stage of almost-stiff peaks (whipping the cream will bind more air into the ice cream and improve the final overall consistency. This is quite important since the overall amount of cream is limited and the extra air will make a difference!). Blend in the yoghurt. 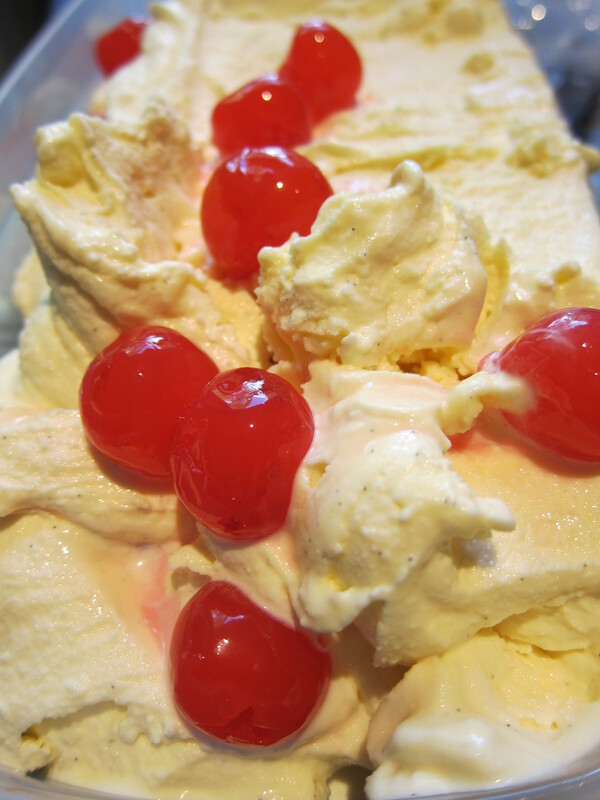 The air captured in the whipped cream will improve the final consistency of the ice cream. Your rhubarb-lemongrass purée should be cooled down (or ideally even chilled) by now. Remove the sturdy pieces of lemongrass (by hand or by using a sieve) and add the remaining purée to the whipped cream-yoghurt. Voilà – the frozen yoghurt base is ready for churning! The lemongrass is far too sturdy for consumption and the slices need to be removed before you churn/freeze your ice cream. Remove the slices by hand or by sieve, making sure that as much as possible of the purée clinging to the slices is returned to the bowl. Churn the base in your ice cream machine according to instructions or still-freeze in your freezer and do the churning manually. 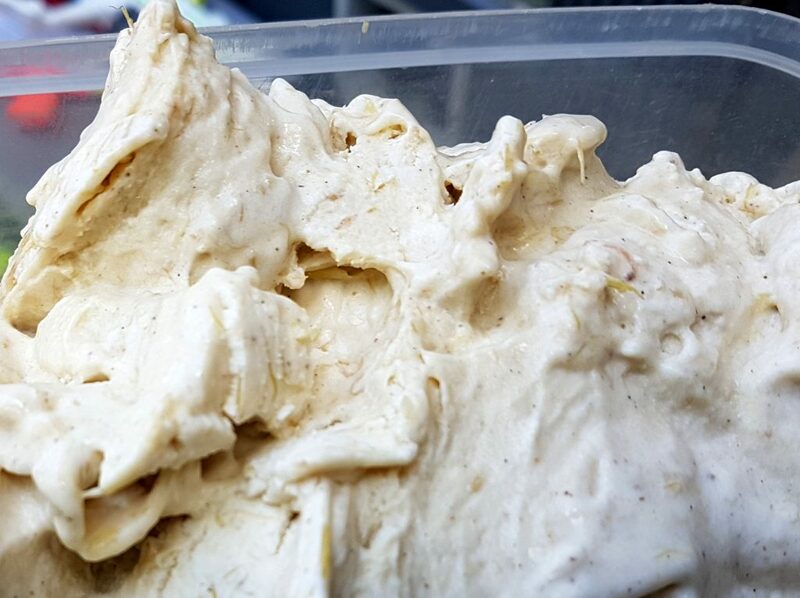 Delicious rhubarb lemongrass ice cream, freshly churned and ready to be enjoyed! 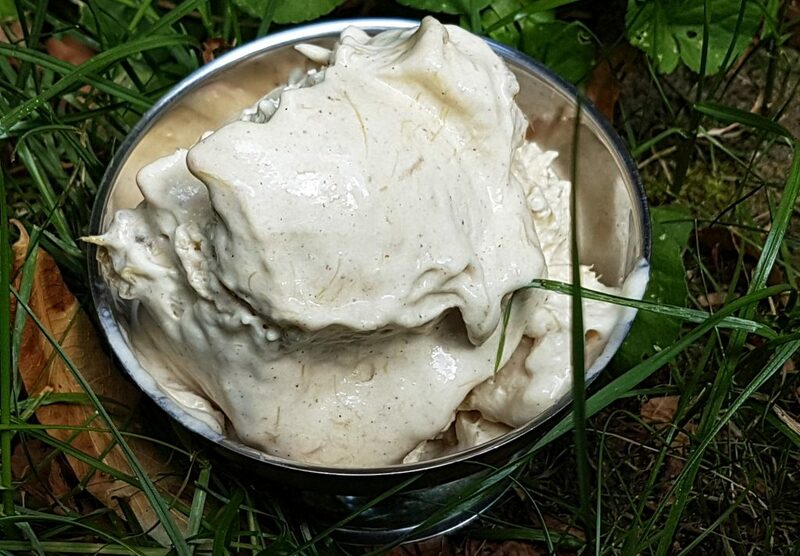 If left in the freezer for any longer time, this ice cream is likely to freeze quite hard – like for most ice creams, it might be a good idea to take it out some time in advance of serving (or even give it a few seconds in the micro-wave oven again …). However, there is also a big chance that there will be nothing left to freeze if you start savouring the ice cream directly after churning 😉 . Mmm … very popular! My happy tasters were even ready to forgive a couple of slices of lemongrass that somehow had managed to remain in the base (you can actually see one of these “forgotten” slices in the picture). Needless to say, they were swiftly removed once discovered. Rhubarb and lemongrass proved to be a very pleasant combination. The distinct, yet rather subtle citrus flavour of the lemongrass harmonises well with the sweet tartness of the rhubarb. 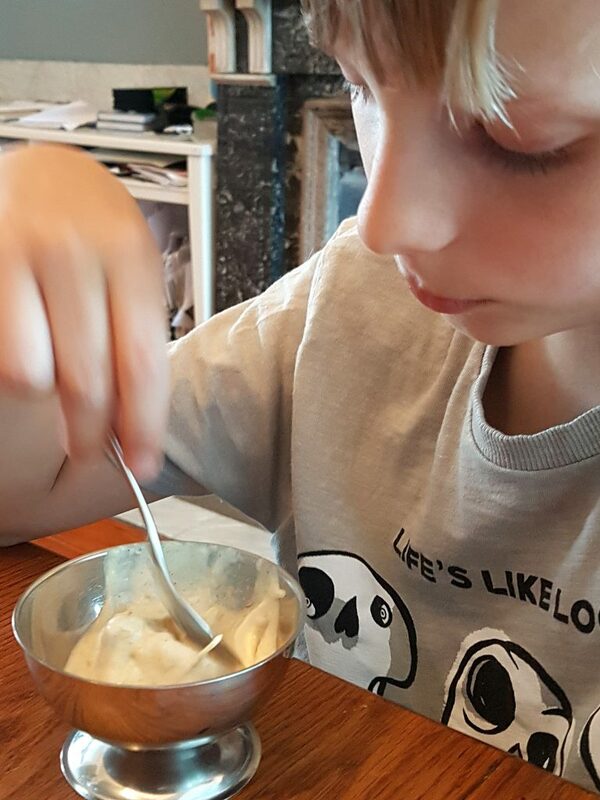 The whole family quickly agreed that this was, indeed, a perfect and delicious summer ice cream! Since it also is so extremely easy to make, there is really no excuse for depriving yourself and your loved ones of the experience – if you have rhubarb and lemongrass, just go ahead! Ps. 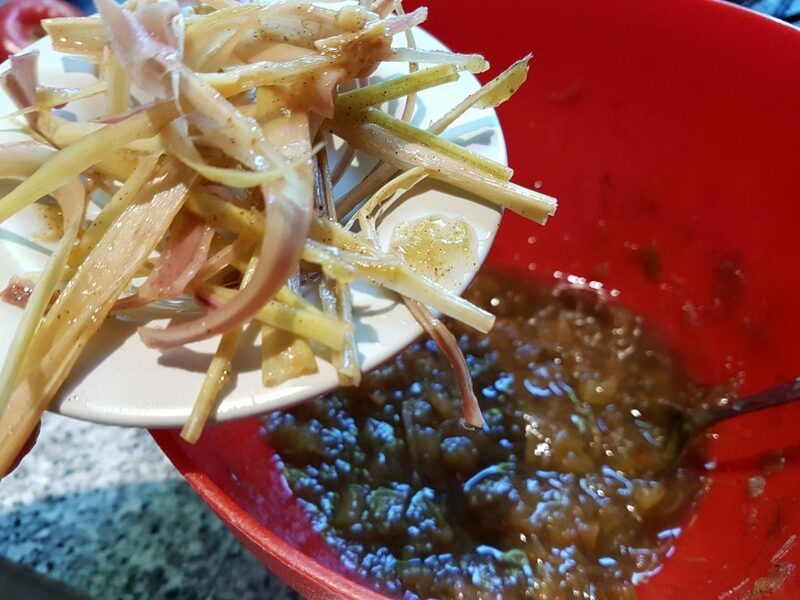 Just remember to remove all those sturdy pieces of lemongrass from your base before churning! Inspired by a flavour-pairing by Stella Parks, this summery Yoghurt ice cream provides a refreshing and delightful combination of sweet rhubarb tartness and the subtle, exotic citrus flavour of lemongrass. 3 stalks of lemongrass, peeled (as necessary) and sliced. Using a micro-wave oven, mix the peeled and rather thin-cut pieces of rhubarb with the sugar(s), and the vanilla, the pinch of salt and the sliced pieces of lemongrass in a microwave-safe bowl. Micro-wave the mix for about 6-9 minutes, eventually whisking once or twice during the process, until the rhubarb has turned into a smooth purée. Take out from the microwave and let the purée cool down. Then, preferably, let the purée chill in the fridge for at least a couple of hours. Whip the cream rather stiff, and blend in the yoghurt. Remove the sliced pieces of lemongrass from the (chilled) rhubarb- purée, and add the purée to the cream-yoghurt blend. Churn in your ice cream machine according to instructions, or - without an ice cream machine - still-freeze the ice cream using your freezer (for best results, see this site's post on how to make ice cream without an ice cream machine). Tried it n love it…. Seems my brothers love it, too.